Developed by a joint venture of the Fifth Avenue Committee, Mega Contracting, Inc. and Magnusson Architecture and Planning, PC, Atlantic Terrace is a new LEED-Gold certified, mixed-use, mixed-income development. Located on a redeveloped brownfield site of a former gas station, Atlantic Terrace brings green and sustainable construction to this lively neighborhood adjacent to Atlantic Terminal, a major transit hub. 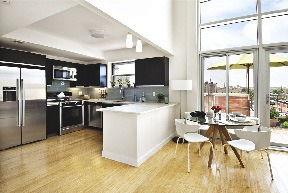 "We designed Atlantic Terrace to harmonize with the surrounding converted lofts in this industrial section of Brooklyn and also to be a good neighbor to the brownstones of Fort Greene," said Magnus Magnusson, managing principal of Magnusson Architecture and Planning. In addition to being LEED-Gold certified, Atlantic Terrace is NYSERDA Energy Star certified and Enterprise Green Communities compliant. "Green" standards are incorporated into all aspects of the architectural design and mechanical and electrical systems. A highly efficient heat pump system features condensing boilers and a cooling tower, working together with high-performance windows and a tightly constructed, well-insulated exterior wall to create an energy efficient and comfortable building. Interior finishes include both recycled and rapidly renewable materials as well as locally-built cabinetry from sustainably harvested wood. A planted outdoor terrace at the second floor is visible from the bright, daylit public corridors and forms a restful visual focal point for building residents. 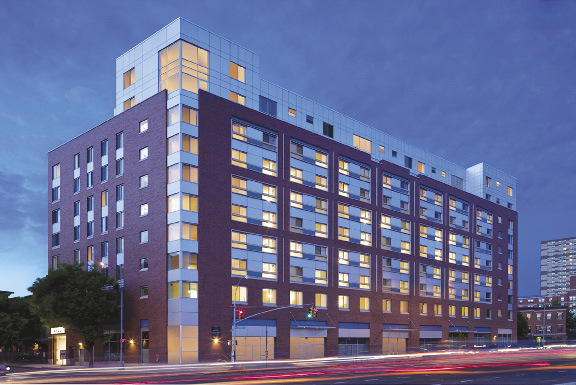 Atlantic Terrace has 80 mixed-income cooperative units in an array of one, two and three-bedroom apartments for low, moderate and middle-income households, as well as market-rate apartments and penthouses. The top two floors consist of seven market-rate duplex loft-style condos, each with double height living areas and large, private terrace. 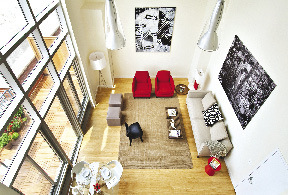 Layouts for the one, two-, and three-bedroom units exceed typical standards for affordable housing. Residents have access to a landscaped roof terrace, underground attended-parking and a party room/lounge, as well as 12,000 s/f of commercial space.